Traditionally, all 70,000 pages of the Tibetan Kangyur would be read aloud in Tibetan monasteries every year. One way in which this monumental challenge was typically accomplished was in the form of a ?resounding,? whereby monks would gather together and simultaneously read aloud different sections of the Kangyur. The words of the Buddha would resound throughout the monastery and surrounding area benefitting everyone who spoke or heard them with the blessing of his speech. Generous patrons would accumulate merit by sponsoring sutra readings. 84000 will pilot ?Found in Translation,? 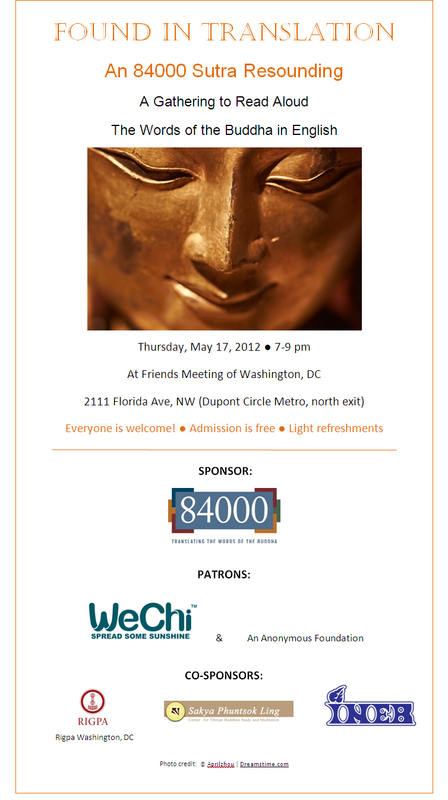 a public, resounding-style reading of sutras in English in Washington, DC from 7-9 pm on Thursday, May 17, 2012. Western students of Buddhism, translators, monastics, friends from the Tibetan community, members of interfaith networks, and those who are cross-culturally curious will come together to experience a sampling of an authentic sutra reading adapted to a modern Western setting. 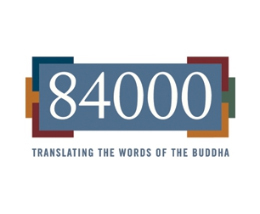 Participants will read and celebrate the sutras that are newly available in English through 84000?s translation effort and recently opened online reading room (at http://read.84000.co), as well as other selected sutras. WeChi.com and an anonymous family foundation have generously stepped up to be the event?s financial patrons, and Rigpa Washington and Sakya Phuntsok Ling are joining 84000 as co-sponsors, providing volunteer and promotional support. For more information about the pilot sutra resounding, please contact deborah@84000.co.